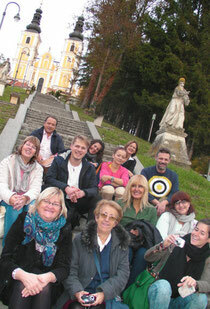 PEOPLE´S MEDIA: Motivating literacy - graz2013s Webseite! Twelve teachers, trainers and educators from 10 countries (Bulgaria, France, Greece, Italy, Latvia, Poland, Romania, Slovenia, Spain and Turkey) stayed in Graz to share, interchange and learn creative teaching methods which increase the literacy of people of all ages and cultural levels. All types of literacy and illiteracy were covered, from battling analphabetism, understanding and expression problems to improve language knowledge and vocabulary, from combatting writer´s block to structure and extend text contents. Participants interchanged teaching methods they knew and learned new ones by practicing them and sharing/discussing the best way to transmit them to others.